What Can a Lightning Strike Do to Your Tree? What Can a Lightning Strike Do to Your Tree? Some trees hit by lightning can live for many more years, but splits and bark removal can leave your tree susceptible to other dangers. If you’ve spent hours on perfecting your landscape, storms probably make you nervous. Rain can cause a lot of damage to your well-planned features, and lightning can lead to serious damage. Lightning doesn’t strike twice, but just one hit to your favorite tree may lead to damage that isn’t immediately visible. A tree doesn’t always have to split in two–sometimes, the effects can run far deeper. Now that storm season is upon us, you should be aware of what lightning can do to your tree. We all know that lightning is what causes thunder, and we know it’s a form of electricity. That inexplicable feeling you get when you walk outside during a muggy, cloudy summer day probably reminds you of the same crackle of energy. 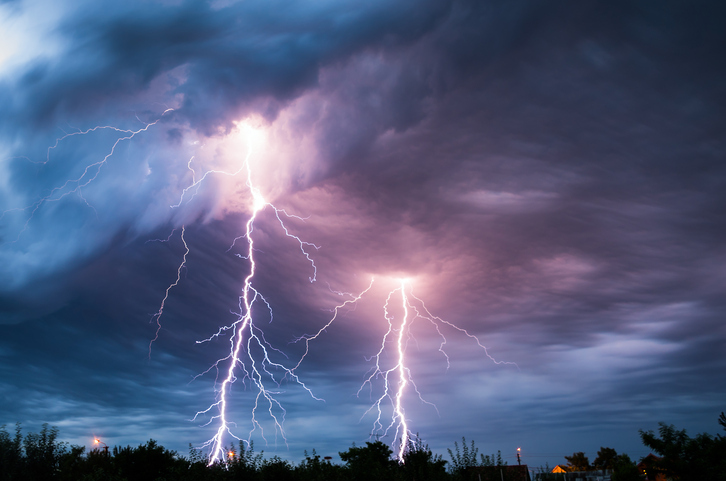 This is because thunderstorms arise when ice particles in clouds collide and create electrical energy. Lightning strikes the Earth when those electrical particles connect with the particles on the ground. It’s fast, hot and bright–if you’ve ever seen a lightning bolt hit close to you, it might have consumed your entire vision. This awesome energy needs to be respected. How can it damage your tree? A tree struck by lightning can have a varied range of damages. Some may explode, due to the lightning super-heating the moisture in the tree. Some may split in half. Some may catch on fire, which is a hazard that can spread to other areas of your landscape and can cause a huge problem. When lightning hits your tree, it doesn’t have to spell immediate doom. Some trees hit by lightning can live for many more years, but splits and bark removal can leave your tree susceptible to other dangers. This can include disease, decay and rot. How can you protect your tree from lightning damage? Simply put, a tree that is cared for is more likely to survive the harmful effects of lightning. This includes watering your tree, mulching it, and ensuring there is enough sunlight reaching its leaves. You can also read up on attaching a copper cable to the tree that will ground it, and this conducts some of the electricity into the Earth. You will know within a few days if your tree hasn’t survived the lightning strike, as it will start to wilt. Need your tree removed? Call Nelson Tree Specialist. Your tree can pose a danger to your yard and landscape, even if lightning has stricken. Branches could fall, and even the entire tree may topple with the next storm. If you think your tree needs to be removed immediately, Nelson Tree Specialist is here to help. We can get your tree removed quickly and efficiently, without any hassle or added stress, and without harming the rest of your landscape. This entry was posted on Thursday, July 14th, 2016 at 5:05 pm. Both comments and pings are currently closed.